These 8" stone serving plates are sliced to about 1/2 " inch thick from boulders that were hand gathered at small working farms in New England. Each plate is unique in shape and color, comprised of stone commonly called granite, but geologically a metamorphic. The top surface is hand-polished to a glossy finish in a nine stage process and finished with a water-proof food-safe seal. The edge is also sealed. We�ve tested the stone plates with hot pans off the stove and from the oven and they are a great way to protect your countertop or table from heat damage. The stone plates are also fridge and freezer safe, but are not for oven use. Dimensions: approximately 8" diameter x �" thick, weighing approximately 2.5 pounds. Care: These stone serving plates should be hand-washed with warm, soapy water. 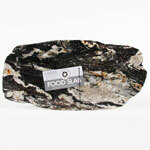 The food safe seal on the Food Slab�s top surface makes it easy to clean and stain resistant.